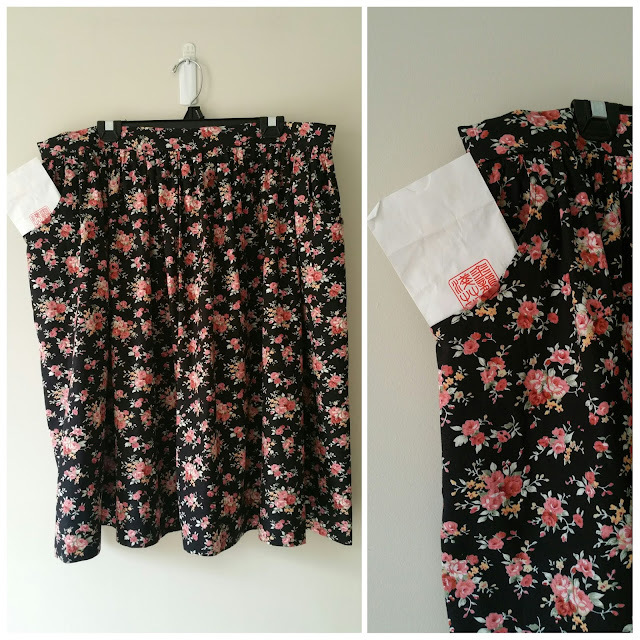 I'm continuing my foray into elastic waist woven skirts with the Cleo Skirt by Made by Rae. This skirt has a flat front with an elastic back- I have a few store bought pants with this type of waist and find them quite comfortable. It was actually much easier to install this type of waistband than I thought it was going to be. The fabric is from My Hung - a cotton that is probably not fluid enough for this skirt. As such I'm find there is just too much fabric going on. I probably could've chosen a smaller size also. I went with the size 2 in the plus size range, but I think a 1 would be more than fine. I was really excited to learn how to sew this cut-out type of pockets - turns out it's very simple. I would want them deeper however if I were going to make this skirt again. I think I stretched the pockets out of bit though as they don't sit flat like I think they are supposed to. As I said before the waistband was quite easy to do but there was A LOT of fabric to gather which made things a bit awkward...again, this could be resolved by sewing a smaller size in less stiff fabric. I'm glad I made this skirt as I learnt some new things - new to me pocket type, partial elastic waistband, gathers - but I'm not sure the style is for me. I'm just not sure how to wear it - there's A LOT of fabric at the waist so wearing a top over it isn't really an option. I'm not one for wearing tucked tops though I have here just to take a few photos. Fabric: cotton from My Hung in Parramatta.